The chowhound pursues soul-stirring, pulse-elevating food from one eatery to another, over many a mile. 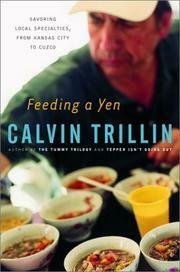 When the times were hard, “there was nothing to do but keep eating,” writes Trillin (Tepper Isn’t Going Out, 2002, etc.) in a collection that relates to foodstuffs the way others might refer to passages from holy books. Let us give thanks to the saving graces of Chinese restaurants, from Ecuador to Nauru, Paris to Prague; to that gnarly pumpernickel bagel that might lure the writer’s daughter back to his hometown New York; to all those bistros and neighborhood markets that fill him up in ways the more famous destinations never do, those temples where he “can’t seem to help wondering, when [his] mind wanders between forkfuls, whether God really intended all that to be done to food.” Likewise, Trillin is willing to pay the dues of the pilgrim on a quest, journeying far and enduring the foul in search of the sublime—like a string of boudin, for example, proving the Cajun dictum “the best boudin is always the boudin closest to where you live” (as long as you live in Louisiana). Better yet, there’s the Cajun wisdom that says you ought to eat your purchase in the parking lot of the place you bought it in, minutes after buying. Trillin is ready to sample 20 bowls of ceviche, knowing he “would wake up the next morning feeling a bit fragile.” His Register of Frustration and Deprivation, foods he is denied because he isn’t geographically positioned to get them, is as plentiful as his turn-downs are rare: “Would it be fair to say that you’re wimping out on the guinea pig?” his daughter asks on a visit to a restaurant in Peru.